Jordan has a 23-20 tip from England's National League. Scott has 4-1 Euro both teams to score treble featuring games from Germany, Belgium and Holland. Greg's has a 5-4 nap and some goals tips from the Europa League. 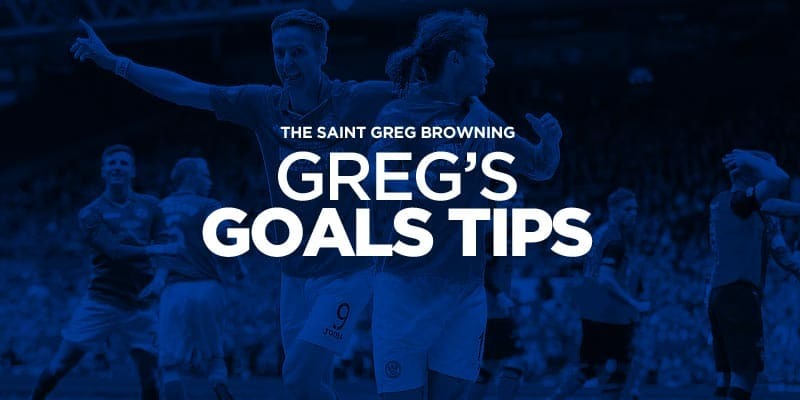 Greg's is backing goals in the Scottish Development League. Serie A don and top sportswriter Paolo Bandini previews Milan v Sampdoria, Torino v Juventus and Atalanta v Fiorentina. Scott has scoured the continent to pick out a 4-1 Euro both teams to score treble featuring games from Germany, Belgium and Austria. Serie A don and top sportswriter Paolo Bandini previews Geona v Inter. Greg has tips from French Ligue 2 and Dutch Jupiler League. Greg has a 7-5 Sunday double with games from north and south of the border. Jordan has a 89-100 double with games from England and Holland. Serie A don and top sportswriter Paolo Bandini previews Inter v Bologna. Scott has picked out games from Germany, Holland and France for his 4-1 Euro both teams to score treble. Serie A don and top sportswriter Paolo Bandini previews SPAL v Milan and Napoli v Lazio. Serie A don and top sportswriter Paolo Bandini previews Fiorentina v Juventus. Greg has an even-money tip from tonight's Scottish action. Serie A don and top sportswriter Paolo Bandini previews Verona v Roma and Udinese v Milan. Scott has picked out games from Spain, Germany and Holland for his 9-2 Euro both teams to score treble. Serie A don and top sportswriter Paolo Bandini previews Sampdoria v Torino and Inter v Crotone. Greg has even-money tips from the Scottish Premiership and English top flight as his top bets tonight. Jordan has a 34-25 tip from the Etihad tonight as West Brom travel to face rampant league leaders Man City. Jordan has an even-money tip from tonight's Premier League clash between Huddersfield and Liverpool. Serie A don and top sportswriter Paolo Bandini previews three key Sunday games. Scott has picked out games from Spain, France and Holland for his Euro both teams to score treble. Serie A don and top sportswriter Paolo Bandini previews Chievo v Juventus. It's Friday night so that can only mean one things for Goals King Greg, a trip to Europe in search of goals in France and Holland. Serie A don and top sportswriter Paolo Bandini previews four tasty Sunday games on the first weekend back after Italy's winter break. Scott has a 33-10 Euro both teams to score treble featuring games from Germany and Holland. Jordan has goals pick from St Etienne v Toulouse.